Do you dread giving your child a bath, trimming her nails, wiping her face or nose, or taking your child to get a haircut? Don’t worry, you are not alone. There are many parents out there who can sympathize with your frustrations. This article will give you some suggestions to try at home with your child to help make these hygiene routines a little more tolerable. To begin, your child may be acting this way because his sensory system is more sensitive to touch then other children’s. In order to help your child, there are several desensitizing activities and techniques that you can use to make his sensory system less sensitive. It will take some time to reduce these sensitivities, but if you hang in there and are consistent with trying these suggestions you may see an improvement. When washing your child with a washcloth, try using a firm pressure instead of a light touch to wash. The light touch of the washcloth may actually be tickling your child. Try singing a song; such as “Head, Shoulders, Knees, and Toes” while washing so the child is aware of which area of the body you will be washing next. Use a firm pressure on the head when washing the child’s hair. Deep pressure is more calming than light touch. You can even try finding a mirror that suctions to the bathtub so that your child can see himself and allow him to help you wash his hair. Try putting less water in the tub so the child feels more secure while sitting. For boys, instead of using clippers that make a noise and tickle, try having the hairdresser use just scissors to trim the hair. 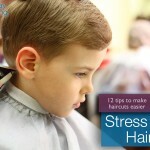 It may not be the exact haircut you like on your son but it will be less stressful for both you and him. While your child is sitting near you watching a show or playing, use a deep massage on his head to help desensitize the head to touch. When combing hair, sing a song or count to 5 so she is aware of how long the brushing is going to last. If possible, have the child sit in a seat that is not in front of a mirror so she cannot see the scissors coming so close to her head. There are even some hairdressers that have TVs and fun chairs shaped like cars, trains and airplanes to make the experience more fun for the child. Ask the hairdresser to use a firm pressure when combing the hair. I know everyone tries to be as gentle as possible with children, but that might not be the best approach in this situation. Try singing “This Little Piggy” when trimming nails to distract the child. Several times a week, use lotion to massage your child’s fingers and toes after a bath to desensitize them to touch in these areas. Try approaching your child from behind when wiping his nose to help prevent the start of a melt-down before you even get a chance to get close to his nose. Allow your child to wipe her nose first and then say “Mommy’s turn” or “Daddy’s turn”. In conclusion, hygiene routines can be very overloading on a child’s sensory system. It takes time and creativity to help your child work through his sensory aversions. Try to be as patient as possible with your child and talk him through the experience. The more often you perform these hygiene tasks the more exposure your child is having to them, which in turn will help to desensitize him to these necessary routines. I hope you found this article helpful and that you will be able to use some of these suggestions in your daily routine with your own children.